The famously ferocious fish on the East Cape of the Baja Peninsula in the Sea of Cortez Mexico are challenges that to be appreciated must be experienced and once experienced become an addiction. Within range of East Cape beach casters, pangas and kayaks is the "Roosterfish Capital of the World," plus jack crevalle, dorado that explode on flies with electric blues and greens that belong in another constellation, striped and blue marlin and sailfish, powerful yellowfin tuna, packs of bonito, tunny's, pargo, explosive wahoo and several dozen other game fish. Fishing based at Van Wormer’s Resorts on an unpopulated beach an hour north of Cabo. This is not an adventure book, although impossible to read without feeling the stir of salt air and tropical adventure, but more of a no-nonsense instructional edification that will shave decades, literally, off the learning curve of successful Baja fly fishing. Rieser explains how to understand saltwater predator feeding behaviors, how to trigger those behaviors, and when to leave them alone. He details in plain terms tackle choices, fly selection and tactical approaches. Line art illustrations complete the text book appeal of implicated knots and systems. 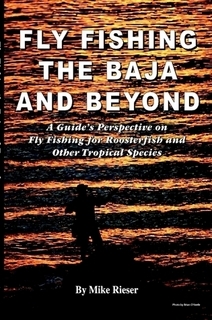 The author specializes in giant roosterfish and Fly Fishing the Baja and Beyond is likely to become the definitive how-to guide for roosterfish fanatics and most certainly a solid textbook guide for targeting the most popular fly fishing challenges on the beaches and impossibly deep trench water of the Sea of Cortez. If you intend to fly fish in the beautiful, peaceful Sea of Cortez this book is an investment that will shorten the learning curve and multiply the excitement. If you want to catch the roosterfish of a lifetime the author will describe, in detail, exactly how to do it. While this book is directed specifcially at fly fishermen, the local insights and insider information will serve conventional tackle anglers well. If you fish the Baja, the Sea of Cortez, the East Cape of Mexico--you will want this book.